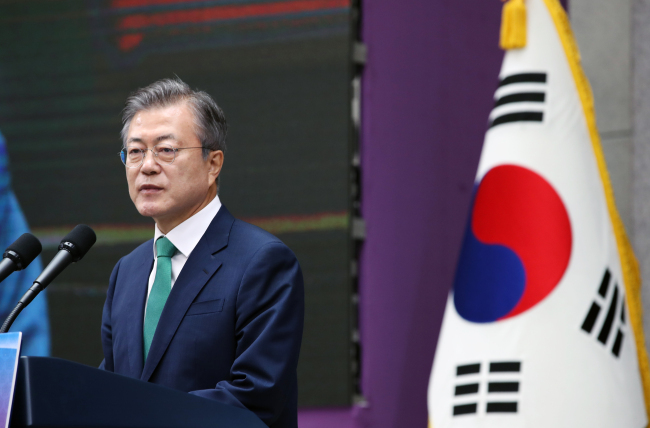 President Moon Jae-in on Thursday urged the judiciary and the National Assembly to push for complete reform of the judicial branch, saying that past wrongs must be addressed. Speaking at an event marking the 70th anniversary of the establishment of the judicial branch held at the Supreme Court, Moon said that the law is the last refuge of the people and that ongoing reforms must meet the public’s expectations. Saying that the wrongdoings of the previous administration have shaken the judicial branch to its roots, Moon said that such difficulties are also an opportunity for reform. It has been alleged that the Supreme Court and the National Court Administration surveilled politically progressive judges, lobbied lawmakers and manipulated rulings to curry favor with the Park Geun-hye administration. “Allegations must be investigated, and any wrongdoings must be righted by the judicial branch itself,” Moon said. Listing judges’ efforts to defend the judiciary’s independence, and to redress wrongful rulings, Moon called on judges to endeavor to make fair rulings, and promised to protect the judicial branch’s independence. At the event, Supreme Court Chief Justice Kim Myeong-su admitted to the shortcomings of the judiciary, and pledged to push forward with the reform efforts. “Since taking office, I have promised the people to focus on a fundamental reform to prevent the judicial branch from repeating mistakes of the past,” Kim said, listing the reform measures underway. The measures include structural reform of the National Court Administration and abolishing the promotion system for judges. Kim added that the authority of the chief justice will be reduced, and suggestions from the reform committee will be widely implemented as part of related efforts.